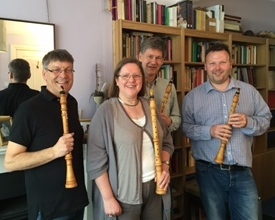 Three wonderful clarinet players visited today and we had heaps of fun exploring the tonal and musical possibilities of baroque clarinets. Eirik, Roar and Tor Egill came from the Norwegian Wind Ensemble with their new baroque instruments in D and in C after Denner (made by Guy Cowley). We played duets, looked at some of the stylistic writing for the instruments and at the composers who knew and used these instrument in the early eighteenth century (Rameau, Vivaldi, Handel). The very simplest of instruments tell a story of their own and will open up some new repertoire ideas for their ensemble for sure! This entry was posted in Uncategorized on May 5, 2015 by Jane Booth (historical clarinet player). I would like information about Jane Booth’s discography.